Information Communication and Learning Technologies (ICLT) is valued at St. Philip Neri Catholic School. We understand the importance of catering for the needs of 21st Century learners so consequently, we are well resourced with technology. 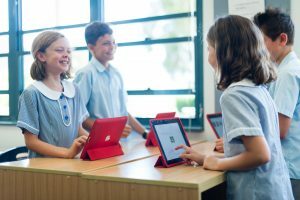 There are enough computers (desktops, laptops and Chromebooks) for students to work collaboratively with a partner and in the upper primary classes there are one to one computers. In addition to computers, all classrooms are equipped with interactive whiteboards and we have a class set of iPads. Our students also have access to robo technics equipment and coding specialists.